Boot Campaign recently provided a $100K grant to the Lone Survivor Foundation to help restore, empower and renew hope for wounded service members and their families. Houston, Tx. (April 27, 2015) – What began in 2009 with a patriot-awakening among friends has now come full circle. 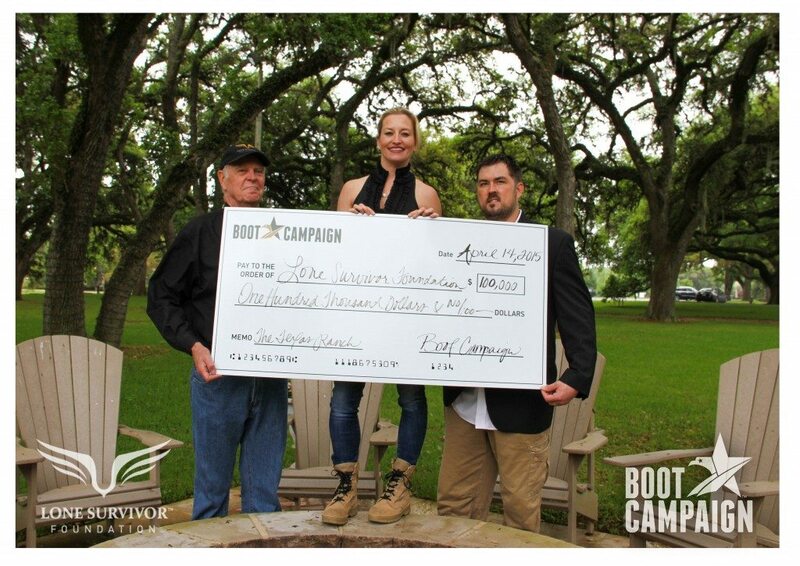 The Boot Campaign presented Lone Survivor Foundation’s Chairman of the Board, Marcus Luttrell, Petty Officer, US Navy SEAL (retired), with a $100,000 grant to be used for Lone Survivor Foundation’s future Texas ranch therapeutic recovery facility. In keeping with the family support and mental wellness initiatives supported by both Boot Campaign and Lone Survivor Foundation, the grant will help fund a retreat focused on physical, mental and emotional healing for service members, combat veterans and their families. The partnership between Boot Campaign and Lone Survivor Foundation has a storied past. After reading Luttrell’s best-selling book “Lone Survivor,” co-founder Sherri Reuland and four friends, now known as the “Original Boot Girls,” launched the Boot Campaign to show gratitude for returning service members. When Luttrell learned his book inspired the nonprofit and saw the group’s efforts to support military men and women, he jumped in with both boots, lending his expertise and guidance to the now nationally-recognized charitable organization. Though the Texas ranch retreat is still in the conceptual phase, Lone Survivor Foundation continues to plan for future construction of the facility. Currently, all Lone Survivor Foundation retreats are held at donated or rented facilities, with their first permanent, Foundation-owned retreat facility scheduled to open in early spring on the Bolivar Peninsula along the Texas Coast. Lone Survivor Foundation retreats provide unique support to combat service members, veterans and their families struggling with post traumatic stress, mild traumatic brain injury, military sexual trauma and chronic pain. Established in 2009, the Boot Campaign is a national 501(c)(3) charitable organization dedicated to promoting patriotism for America and our military community; raising awareness of the unique challenges service members face during and post-service; and providing assistance to military personnel, past and present, and their families. Retail sales of combat boots, apparel and mission-focused merchandise, general public donations and corporate sponsorships fund programs that support military families. These efforts extend to all generations of military personnel who endure significant physical, emotional and circumstantial hardships resulting from their service and sacrifice. Learn more at bootcampaign.com. The Lone Survivor Foundation (LSF) is a federally approved 501(c)(3) nonprofit organization. Founded in 2010 by US Navy SEAL (Ret.) Marcus Luttrell, the Lone Survivor Foundation restores, empowers, and renews hope to combat service members and their families through health, wellness, and therapeutic support. LSF serves all military branches and backgrounds with an emphasis on service members and veterans from Operation New Dawn, Operation Enduring Freedom and Operation Iraqi Freedom. Learn more at lonesurvivorfoundation.org.